to make an evening of magical entertainment. 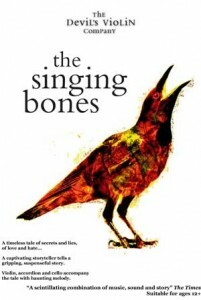 with their unique blend of storytelling, live music and theatre. Slick and spellbinding, few theatrical experiences come close to this superbly crafted show which brings the ancient art of storytelling firmly into the 21st century. Unlocking forgotten folk tales that inspired some of English literature’s greatest works – Shakespeare’s King Lear and Chaucer’s Franklin’s Tale and Wife of Bath’s Tale -The Devil’s Violin takes them on a new voyage of discovery. 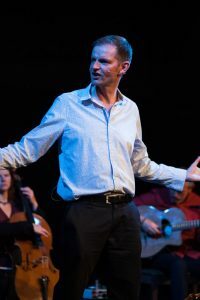 Aided by the dramatic, driving rhythms of a skilled and inventive strings and accordion trio, Daniel Morden – one of the UK’s most compelling and applauded storytellers – lures the audience onto a rollercoaster ride in this haunting, hypnotic fusion of music and word. Love is put to the test in three tales as the audience is transported to King Arthur’s Camelot, the Breton shores and the ancient Britain of King Lear. Meet a knight on a year-long quest to discover what women really want and enter a world where Cinderella meets Cordelia and “Miss Mossy Coat” emerges from “The Land of Ladles” to thrill a prince. An alchemic experience that will have you on the edge of your seat, A Love Like Salt is a rich tapestry, peppered with magic and morals, villains and lovers, desire and disguise and even a man hellbent on selling his soul to win a woman. Three wonderfully engrossing tales drawn from the past and skillfully spun into gripping stories for the present. Timeless and thought-provoking this is a show guaranteed to fire the imagination. Come and see how the story ends. 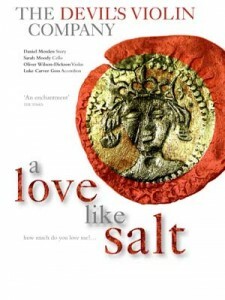 A Love Like Salt has been made possible by the generous support of Arts Council England, The Arts Council of Wales and The John Fell OUP Research Fund, University of Oxford. Thanks also to the Bristol Old Vic Ferment and The Tobacco Factory Theatre Bristol for additional support. A Love Like Salt was commissioned by the Bodleian Library and English Faculty at the University of Oxford, with generous support from the University’s John Fell Fund. The show’s premiere, on the 20th April, will take place in the Divinity School, right at the heart of the historic Bodleian Library. At the same time, the Bodleian is mounting a major exhibition, The Romance of the Middle Ages http://medievalromance.bodleian.ox.ac.uk , which highlights its rich collection of medieval romances and the way that they have inspired writers and artists through the centuries, including Chaucer and Shakespeare, William Morris and Edward Burne-Jones, and more recently C.S. Lewis, J.R.R. Tolkien, Philip Pullman and Monty Python.